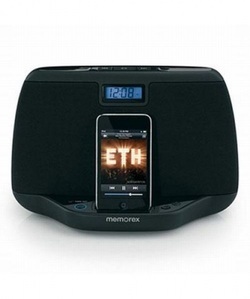 This fully functional iPod dock* not only provides superior sound quality, it records full color video and images. This is a great gadget to use as a nanny cam or to watch folks who come into your home for cleaning or repair work while you're away. It is unlikely that any one would suspect a camera in this increasingly commonplace device. The dock is made of 20% recycled plastic. High resolution video and audio. Records clear 1280 x 960 resolution video at 30 frames per second. You can record either continuously, when motion is detected, or audio only. The files are stored to 16 GB of internal memory; when the memory is full older files are automatically overwritten. Since the dock runs off the power supply plugged into the wall, it can record indefinitely. Easy to use. Turn on with the flip of a switch. Operation is simple with a remote control that works from up to 15 feet away. Charge and transfer files with the USB cord. *Please note iPod not included, image is for demonstration purposes only.